Our February Caregiver Award Winner was awarded this week! CAREGIVER of the Month is Herma Stewart, Day Nurse for the Haven Residence at The Kensington. Herma was nominated by the Director of Nursing Mary Ann Durso and the Executive Director Celina Watson for her positive impact on the physical as well as spiritual well-being of the patients, their families and staff. 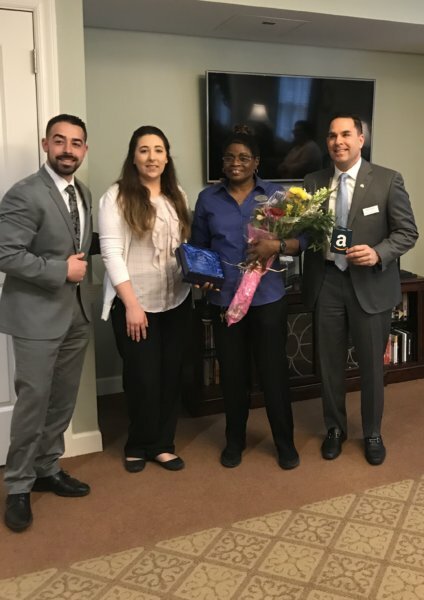 We surprised her monthly staff meeting with cookies, flowers, a plaque and a $100 Amazon gift card! Executive Chef Norm Fintz provided delicious refreshments and also joined us for the presentation. Herma is pictured receiving her award from Matthew Fiorillo, Jenna Triano and Joseph Murray of Ballard-Durand.